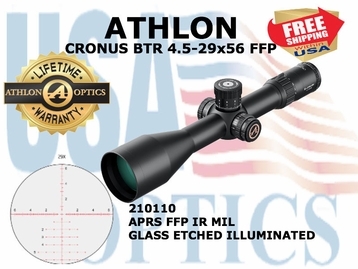 The Cronus BTR from Athlon is a quality / Japanese made scope with exceptional HD Glass. 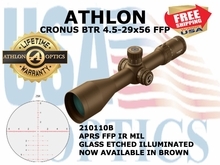 This Cronus 4.5-29x56 Model has a APRS first focal plane illuminated MIL reticle - and is Quality from End to End!! 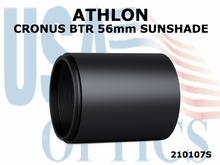 Whether you want to do precision long-range shooting and tactical applications, or extreme long range hunting adventures, the new Cronus BTR scope is just what the doctor ordered. They have added markings at 300, 500, 800 and 1600 yards. It has been designed with a new reticle, plus a re-designed the battery compartment to make it easier to adjust the illumination. The best just got better! If you are looking for the best in rifle scopes, look no further. ➢ HD Glass - HD Glass gives you the utmost contrast, light transmission, and the sharpest image. 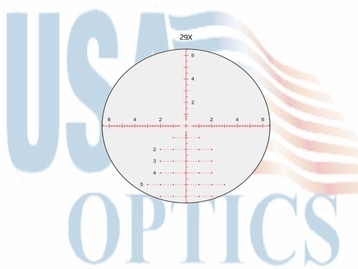 ➢ First Focal Plane Reticle - First focal plane reticle stays valid at all power settings allowing you to fully utilize the specially designed reticle that shrinks or grows along with your target as you zoom in or out. The reticle offers quick target engagement at low power while offering precise holdover positions with finer details. 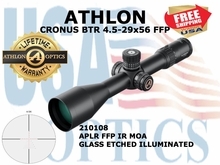 ➢ Etched Glass Reticle - Reticle etched on the glass that provides excellent backing support for complex reticle design and offers great durability and much higher shock resistance to recoil. 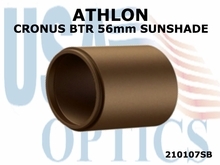 ➢ Advanced Fully Multicoated - Fully Multicoated optics effectively reduces reflected light and increases the transmission of light giving you a brighter image than normal single coated lenses. ➢ XPL Coating - XPL Coating gives you an extra protection on the exterior lenses from dirt, oil and scratches or anything else mother nature can throw at you. ➢ Precision Zero Stop System - The system allows you to lock down your zero position and dial back to it with a sharp and precise stop right at your zero mark even when you are turning it in pitch-dark or blind folded. ➢ High Precision Erector System - The high precision erector system processed by high precision CNC machine with +/- 0.0001mm tolerance level to provide you the most accurate power settings and smoothest magnification change. ➢ Exposed Tactical Direct Dial - Exposed Direct Dial Turrets for elevation and windage allow you to quickly make adjustments as you need and engage your target within a blink of the eye. ➢ One Piece Tube Construction - Heat treated one piece tube gives the scope extra strength over multi-piece tubes. A one piece tube is better at keeping moisture out thus keeping your scope fog proof for the life of the product. ➢ Waterproof - Waterproof to protect the scope in the harshest weather conditions or if accidently submerged underwater. ➢ Fog proof - Fog proof to allow you to immediately engage your target when you take your rifle to cold ambient temperature from warm inside. » Eye Relief - 3.6-3.8"